The big talking point after this League Cup Match surrounded the four additional minutes that the referee added on for stoppages, with Annan holding on by the scruff of the neck for what looked like another superb victory after their Petrofac Cup victory over Airdrieonians, Dale Histon struck deep into injury time score a life saving goal to earn Queens the life line of extra time. It was a bitter blow for Annan to take and their hopes took a real nose dive when Steven Black was sent off for a second yellow and to rub salt into the wound Derek Lyle scored the winner in a goalmouth scramble after the ball was adjudged to have crossed the line. It was the decisive goal in an enthralling cup tie, which was not a classic football match spoiled to a great extent by the windy conditions but the match had the fans of both teams on the edge of their seats throughout the match. 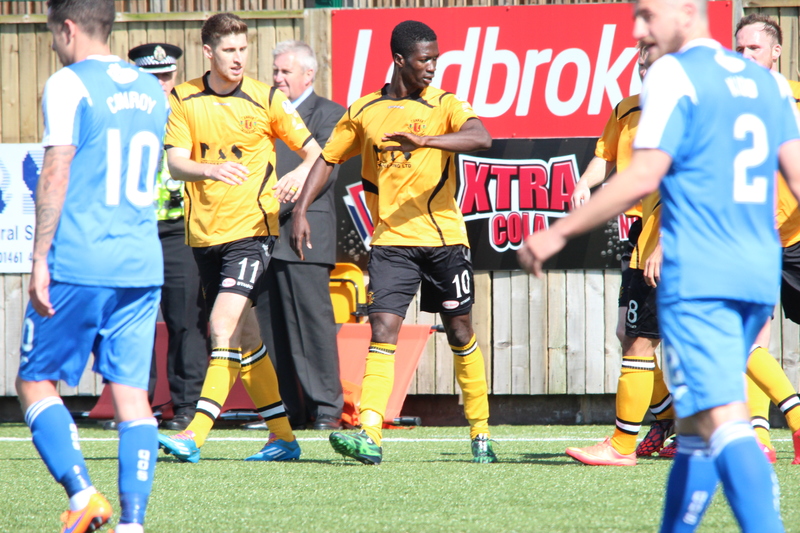 The opening 10 minutes were dominated by the Queens with Annan defending deep. Hart pulled off a good full length save to deny Kyle Jacobs in the 12th minute. Annan won a free kick 30 yards out but Weatherson’s well struck free kick was confidently saved by Thomson. Smart Osalodor who looked a threat throughout the match for Annan was unlucky to watch his effort crash off the cross bar in the 21st minute, after the Annan forward wriggled past a couple of challenges before hitting a good effort from 12 yards. Osadolor was then denied by a timely Kidd challenge just as the Annan youngster had manouvered himself into a very promising position. Hart was then called into action at the other end when he saved Ryan Conroy’s shot then the Queens player was booked for diving as he homed in on Hart. As the game edged towards half time Annan were being forced to defend deep, Steven Sloan came to Annan’s rescue when he cleared Lyle’s shot off the goal-line in the 40th minute. Then following a couple of corners Queens stuck with a magical goal. It was Ryan Conroy who volleyed home from Mark Millers corner kick from 25 yards with an unstoppable shot – a possible contender for goal of the season. Annan started the second half on the attack with Flynn’s effort from the edge of the box flying over the bar. Minutes later Weatherson’s shot was blocked. Queens forced a couple of corners the opposite end before Annan equalised in the 58th minute with another fine goal. Steven Black was the creator when his free kick swung to the back post and was powerfully headed into the top corner of the net by Smart Osadolor. It was just the break Annan needed and all of a sudden it was Queens who were under pressure. Minutes later Annan went ahead from a corner fired into the near post by Osadolor and Weatherson got the vital touch ahead of Russell to guide the ball into the net. Annan’s joy was short-lived and lasted 3 minutes. It was a contentious goal when Derek Lyle picked the ball up in acres of space in what looked like a suspiciously offside position but the striker had plenty of time and room to pick his spot past the stranded Jordan Hart to square the game at 2-2 time 65 minutes. Annan responded again in the 71st minute when Rabine Omar picked out Osadolor down the left and his presence appeared to create uncertainty in the Queens defence with Keeper Robbie Thomsons’s kick falling invitingly for Weatherson who finished with a lob into the empty net past the stranded Queens defence. The introduction of Aiden Smith in the 76th minute gave Queens a new outlet and this was soon followed by the introduction of Hooper and Pickard in the 82nd minute as Queens went for broke. Hart pulled off a another superb save to deny Hilston. The Annan goal then survived a real scare in the89th minute when Conroy’s 25 yard free kick cannoned off the inside of the inside of the post with Hart beaten to the world. The fans were leaving the ground as Dale Hilson struck a real life line for the Doonhamers when he cut in from the right finishing with a great shot into the roof of the net to send the game into extra time. Annan were dealt a blow in the 93rd minute when Steven Black was red carded for his second yellow and in the 100th minute Queens Derek Lyle struck a scrambled goal after Jacobs shot cannoned off the cross bar. It proved to be the decisive moment in an enthralling cup tie. Annan’s troubles were compounded when Rabine Omar was sent off in the 117th minute for a reckless tackle. Annan Athletic – J Hart, S Black, S Swinglehurst ( C Liddell 125 min), M McNiff , P Watson, S Sloan ( J Watson 125 min), R Omar, M Flynn( s Norman 102min) ,P Weatherson, S Osadolor, S McColm ( S Osalador 80 min). Substitutes unused C Liddell, D Wadge, D Wood, B Wagner, B Currie GK. Queen of the South – R Thomson, L Kidd ( J Pickard 82 min), A Dowie, C Higgins, M Miller, D Lyle, R Conroy, I Russel (A Smith 76 min), K Jacobs, D Hilson, J Marshall (S Hooper 82 min) Substitutes unused S Rutherford, O Moxen, G Skelton, J Atkinson GK. Referee K Graham Assistants S Mitchell and M McCarthy.